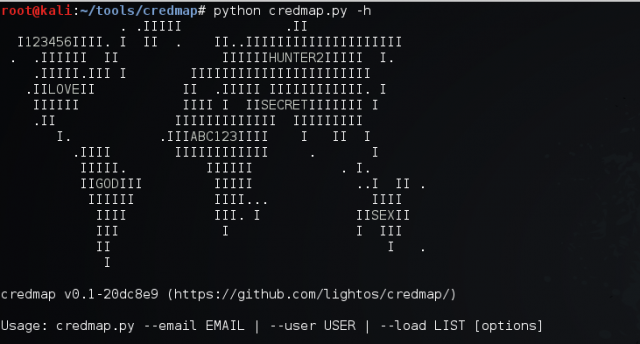 Credmap is an open source credential mapper tool that was created to bring awareness to the dangers of credential reuse. It is capable of testing supplied user credentials on several known websites to test if the password has been reused on any of these. It is not uncommon for people who are not experts in security to reuse credentials on different websites; even security savvy people occasionally reuse credentials. Credmap takes a username and/or e-mail, and a password as input and it attempts to login on a variety of known websites to verify if these credentials have been reused on any of them. -s/--safe-urls only test sites that use HTTPS. ./credmap.py -u johndoe -e johndoe@email.com --exclude "github.com, live.com"
./credmap.py -u johndoe -p abc123 -vvv --only "linkedin.com, facebook.com"
./credmap.py -e janedoe@example.com --verbose --proxy "https://127.0.0.1:8080"
./credmap.py --load creds.txt --format "e.u.p"
./credmap.py -l creds.txt -f "u|e:p"